Vodka is a distilled alcoholic beverage comprised primarily of water and ethanol. Vodka is traditionally produced by distilling fermented cereal grains such as sorghum, corn, rye or wheat through extensive use of filtration. It can also be made from potatoes, molasses, or soybeans and some modern vodka brands come with fruit or sugar flavorings. There is very little available historical material pertaining to the actual origins of vodka but the earliest recorded use dates back to the early Middle-Ages in Poland where it was used traditionally as medicine. Smirnoff is currently the world’s leading vodka brand with sales volume of about 25.5 million 9 liter cases in 2016 alone. Founded in Moscow in 1864, Smirnoff is produced by the British company Diageo which is also the leading vodka supplier in the U.S., accounting for a 20 percent share vodka volume sale in 2016. Also in the U.S., vodka generates by far the highest in sales volume within the U.S. spirits industry with a 2016 sales volume that amounted to about 69.8 million 9-liter cases. In 2016, over 25 billion U.S. dollars in retail sales was generated from the production of vodka in the U.S. The volume of vodka imported to the United States in that same year amounted to around 42.84 millions of proof gallons while about 2.6 millions of proof gallons were exported from the United States. Smirnoff is also the leading vodka brand in the United States, accounting for a 13 percent share of vodka volume sales in 2016. .
Vodka produced in the United States is required to have a minimum alcohol content of 40 percent. 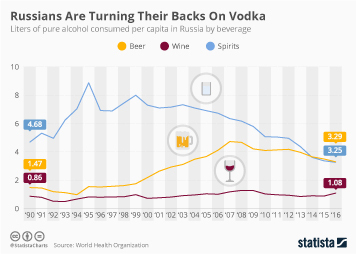 This is the same with most of the significant producers and consumers in the “vodka belt” that include: Russia, Poland, Russian, Belarus, Ukraine, as well as the Baltic states of Estonia, Latvia, and Lithuania. In the European Union, the established legal minimum is 37.5% ABV. Vodka can be drunk neat, mixed or served chilled with ice. Vodka is also popularly used in cocktails and mixed drinks such as: martini, Cosmopolitan, vodka tonic, Screwdriver, Greyhound, Moscow Mule, and Bloody Mary. In 2016 alone, around 84.52 million U.S. dollars was spent on advertising for vodka in the United States. Volume sales share of Smirnoff brand in the U.S.